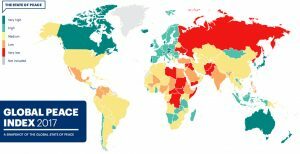 England ranks ‘high’ on the peace map of the world. Vision of Humanity released the new map of the most dangerous countries in the world. Luckily, the UK is at the other end, being ranked as one of the most peaceful in the world. United Kingdom is on the 122 spot, from 163 countries in the analysis, far away from the top 20 most dangerous. More details in the article on Atlas and Boots. Source of photo: Vision of Humanity.